May. 1, 2017 6:30 a.m. 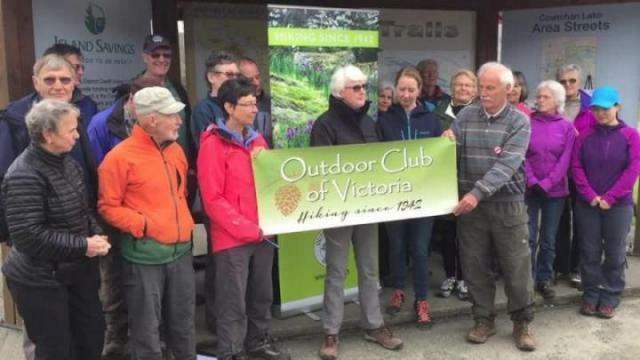 The Outdoor Club of Victoria presented the Vancouver Island Spine Trail Association with a cheque for $20,000 to beused to help complete a 700-kilometre trail that organizers hope will become a second “Camino de Santiago” for hikers. The group of enthusiastic hikers were celebrating Earth Day and their group’s 75th anniversary with the announcement,made at Lake Cowichan’s Saywell Park Saturday morning, and then they headed out for a hikes up Bald Mountain andother trails in the area. According to OCV president Liz Bicknell, the $20,000 came from a grant from the provincial government, aimed at helpingincrease fitness among B.C. residents. They presented the money to Elena Elder of the Vancouver Island Spine Trail Association to pay for some of the finaluncompleted bits of the 700-km trail. Already more than 70 per cent complete, the Spine Trail has been built mainly by hand by volunteers. “When it is completed, this trail could well become the second ‘Camino’, drawing people from all over the world toVancouver Island,” said Bicknell. The Spine Trail group are all volunteers who have been constructing the non-motorized trail, which will be reserved forhikers, cyclists and equestrians. According to past VISTA president Gil Parker, linking the Cowichan River section of the trail west and north to Port Alberniwill follow a route south of Cowichan Lake. “There are a number of short trails that can be used in combination with existing roads and ultimately with logging roadsto reach the western end of Cowichan Lake. At that point, we connect with the Tuck Lake Trail, Runners Trail, and AlberniInlet Trail to reach Port Alberni,” he said. Improving these links, and upgrading sections of the Tuck Lake and Runners trails and “to be partial seed fundingtowards bridge construction over the Franklin River” will be the main uses for the donation, he said.